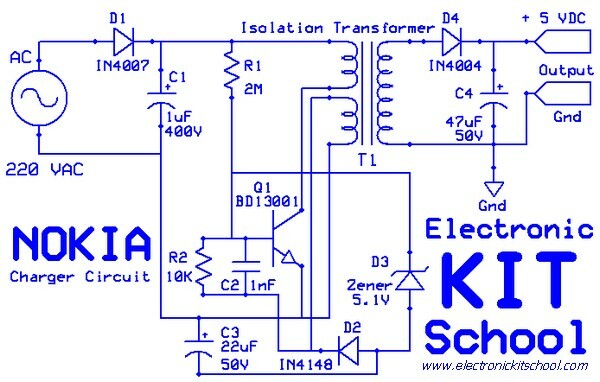 Electronic Kit School. - When i opened the Nokia handphone charger, i saw that there is small charger circuit based on the low-power transistor that arrange with the zener diode, capacitor, resistor and also isolation transformer. In here, i will show you the circuit of this Nokia transistor charger that using the low-power transistor CD13001 like in Figure 1 below. With this article, i also will give you the result of my simulation using Proteus software and i will also describe to you how this circuit work properly. Circuit like in Figure 1 above show you about Nokia Transistor Charger Circuit using The Low-Power Transistor CD13001 that i re-drew from real Nokia charger. Nokia charger circuit only need a little component like 4 capacitors, 3 rectifier diode, 1 zener diode, 2 resistors, 1 transistor, and 1 isolation transformer. All components arrange to make the solid work as low voltage and low current charger that suitable with Nokia handphone. When i measure the output DC voltage of this charger circuit using Heles YX-360TRes multitester, it show that the output of this charger circuit are more than 5 volt DC. And how this charger circuit work? Firstly, we should know that the input of this charger is connected to 220 VAC with 50Hz source. This voltage than rectify by diode D1 become DC voltage and filtered the ripple using C1. Output of this voltage beside flow to the isolation transformer T1, it is also used to give forward bias to transistor Q1. Zener diode D3 that give threshold voltage 5.1V will stabilize the output transistor that connected to T1 will give output voltage more than 5 VAC that out from T1. D4 used to rectify the AC volt from T1 become DC out that stabilize using C4. So, the last we can use this charger circuit to charger handphone with battery volatge 3.7 until 5 volt DC like in Nokia handphone.